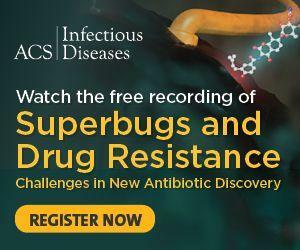 ACS Infectious Diseases recently hosted the webinar “Superbugs and Drug Resistance: Challenges in New Antibiotic Discovery.” The subject of drug-resistant bacteria has only become more important in recent years. Have you kept up with the latest research and developments in this critical area? We compiled a quiz based on the webinar to test your knowledge. Not quite ready to take the quiz now? Maybe you need to watch the webinar first. The hour-long presentation, Deborah Hung, M.D., Ph.D., shared a clinical perspective and Eric Brown, Ph.D., shared a research perspective before taking audience questions on where we stand in the battle against drug resistance and superbugs. To hear the entire presentation and Q&A session and to see their presentation slides, register to watch a free recording of the webinar. Learn more about ACS Infectious Diseases.